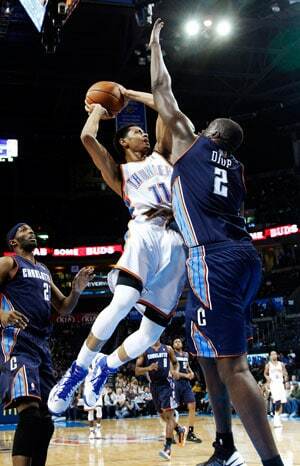 Oklahoma City Thunder opened up the biggest halftime lead in an NBA game for 21 years and went on to crush the Charlotte Bobcats 114-69 on Monday. The 64-24 lead was the fifth-biggest halftime advantage in the NBA's shot-clock era and the most since Golden State led Sacramento by 47 at the main break in a 1991 game. Kevin Durant scored 18 points while Russell Westbrook had 12 points and 11 assists for the Thunder, who pulled all their starters by early in the third quarter. Monday's other big game was a much closer affair, with the Brooklyn Nets needing overtime to edge the New York Knicks 96-89 in the opening game of the new-look Big Apple rivalry, with the Nets having relocated from New Jersey. Jerry Stackhouse made the tiebreaking 3-pointer in overtime as the Nets controlled the extra period of a playoff-like game that neither team led by more than seven. Brook Lopez had 22 points and 11 rebounds for the Nets, who improved to 7-1 in their new home and tied the Knicks atop the Atlantic Division at 9-4. Utah Jazz also survived a close home game, surging in the second half to sneak past the Denver Nuggets 105-103, with Al Jefferson scoring a season-best 28 points and Derrick Favors sinking three late free throws. The Nuggets had a chance to tie it with 3.6 seconds left but Ty Lawson was double-teamed and passed too late for Corey Brewer to get off a final shot. The Jazz, who improved to 6-0 at home, trailed by as many as 16 in the first half and were down 12 with 7:27 left in the third before going on a 14-2 run to tie it. The Memphis Grizzlies maintained their status of holding the best record in the NBA but were relatively lethargic in an 84-78 home win over the Cleveland Cavaliers. Zach Randolph and Marc Gasol scored 19 points each for the Grizzlies, who trailed with 8:28 left, but closed the game on a 13-4 run. An even-more-impressive finishing burst came from the Milwaukee Bucks, who downed the Chicago Bulls 93-92 despite having trailed by 27 points at one stage. Ersan Ilyasova scored 14 of his 18 points in the second half for the Bucks, who surged back into the contest with a 31-4 run. The win ended a run of nine straight losses at Chicago and kept the Bucks ahead of the Bulls atop the Central Division. Chicago's Richard Hamilton scored a season-high 30 points but missed a shot at the buzzer that could have won it. The Washington Wizards remain winless after 12 games following a humbling 118-92 home defeat by the San Antonio Spurs. The Spurs had seven players in double figures as they continued their successful road trip, winning the first four games of a six-game away stint. Unlike the Wizards, the New Orleans Hornets arrested a losing streak, winning their first game in eight by downing the Los Angeles Clippers 105-98. Greivis Vasquez had 25 points and 10 assists for the Hornets, who restricted Clippers star Blake Griffin to making only one of nine shots in 35 minutes, finishing with a career-low four points before fouling out late. Ryan Anderson and Jason Smith each scored 17 points for the Hornets. The Detroit Pistons defeated the Portland Trail Blazers 108-101, with the victory set up by young guard Brandon Knight's 16 first-half points.